The namesake comes from the old Woolworth’s five and dime once housed in the building, but the architectural inspiration comes from the Woolworth building in New York City. Creature initially conceived of a deconstruction of the opulence found throughout the original Woolworth building. Ornamentation is translated through raw, commonplace construction materials, the beauty emerging from the assembly of materials rather than the materials themselves. 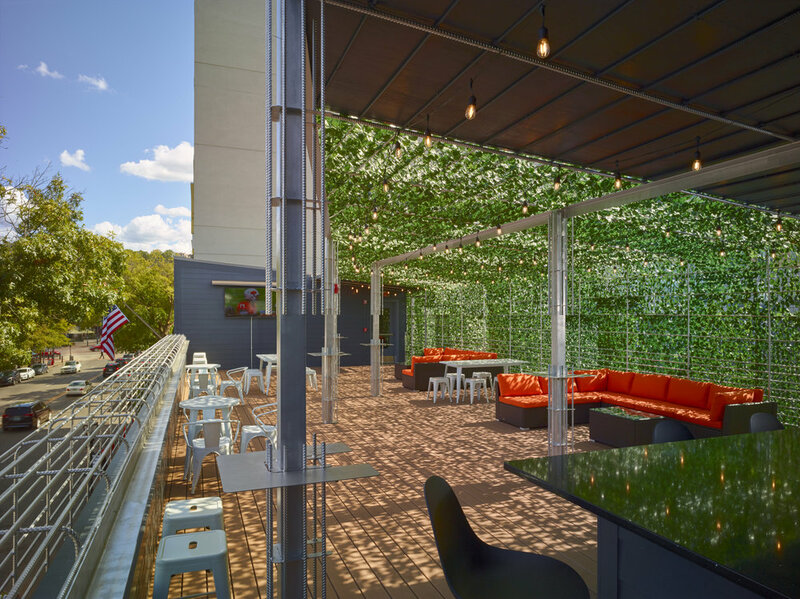 A rebar cage morphs from signage into guardrail into ivy trellis above a new rooftop bar. Concrete masonry units are turned on their side and backed with translucent panels which shield the kitchen but use its light to cast a puppet show of shadows running back and forth. Raw plywood sheets clad both the end wall of the duck pin bowling lanes and the soffit above the bar. These panels are cut with a pointilized reference to floral patterns of the Woolworth building, exploded to a macro scale.